Happy New Year everyone! We don’t know about you, but we’ve spent the past few days reflecting on the year behind us, making (and already breaking) new resolutions, and nursing ourselves back to health. Although we’re sick and tired of Christmas music and tinsel, our winter munchies are still hanging tough. In other words, we notice the craving for the sweet flavors of the holidays still to be very present. So, what do you do to cure the post-holiday blues? Where do you go? The Flats, off of Wilshire and La Cienaga in Beverly Hills, is the type of place where you can enjoy the busy radiance of the city from a laid-back and intimate setting. A full food menu featuring complex, yet unpretentious fare that includes a weekday happy hour only compliments their impressive cocktail list further. With a winter menu devoted to highlighting all of the best flavors of the season, our bartender Garrett assisted us in choosing what was most likely to satisfy us from the selection. 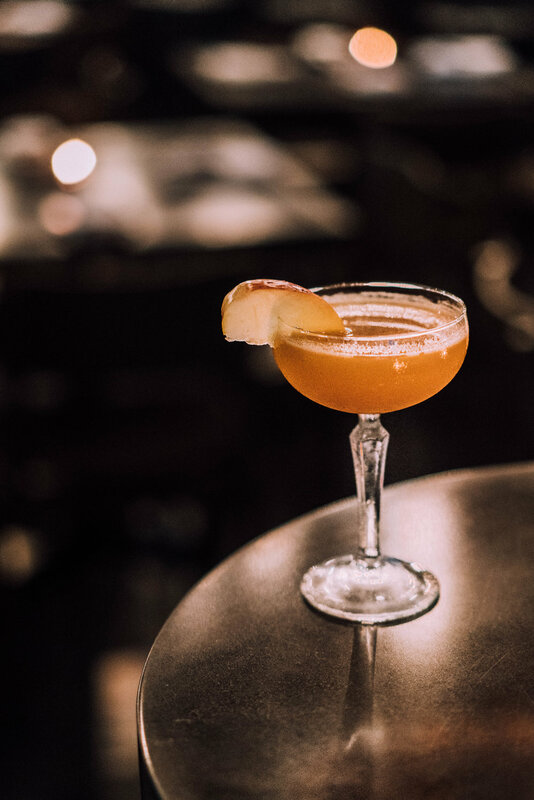 We started out with Apples, their Applejack Cocktail, which was derived from Harry Johnson’s Bartender’s Manual, and is mixed with their house-made Brown Butter syrup to really bring out the aromatics. Apples, spice and everything nice, it also contains lemon juice, a house apple cider, and cinnamon. It’ll bring you back to memories of grandma’s apple cobbler in no time! Especially if she preferred to have her cobbler with a glass of brandy. Up next we moved onto Carrots, The Flats' version of a White Russian. Incorporating carrot juice into to the cream brings out a sweet and earthy flavor that compliments the coffee flavor seamlessly. Simple and timeless, the White Russian contains vodka, espresso liqueur, and carrot cream. Third, we have Winter Citrus. The Flats’ take on the French 75, made with their house-made Winter Sherbet, is composed of oranges, tangerines, and Meyer lemons, along with an Amaro as a base in this effervescent take on the classic. The Winter Citrus is made with Los Angeles Amaro, Winter Sherbet, fresh lime, and is topped with Prosecco. Although we wished these delicious treats could keep on coming forever, we had to end somewhere. This is where we were graced with Maple, the “Bourbon Fix.” I don’t know about you, but I love a cocktail with cobbled ice. This sweet and not-so-sticky maple creation consists of bourbon, Grade B maple syrup, lemon juice, and blueberries. Head into The Flats as soon as possible and try one of these tasty treats paired with one of their delectable flatbreads or some delicious fried hot chicken sliders. Until next time, Bon Appetit!